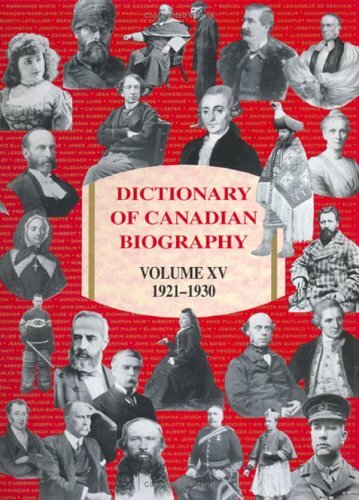 This new volume of the Dictionary of Canadian Biography / Dictionnaire Biographique du Canada (DCB / DBC) presents well-written, carefully documented and meticulously edited biographies of Canadians from all walks of life. Its literary and scholarly standards make it, like its predecessors, the definitive biographical reference for its period of history. The 619 biographies by 446 authors present a panoramic view of the origins of modern Canada, its political landscapes, economic changes, educational institutions, cultural developments, and athletic achievements. The volume’s coverage is inclusive, ranging from murderers to artists, from business magnates to religious leaders, from Canada’s First Peoples to new immigrants. There are labour leaders, farmers, feminists, and naturalists as well as all the prominent leaders in all aspects of Canadian life. The dominant theme of this volume is the emergence of a country engrossed by material gains and aware of broadening horizons. Sir Clifford Sifton, federal minister of the interior, Sir Lomer Gouin, premier of Quebec, and Sir Robert Bond, premier of Newfoundland, symbolize this age of development. The lives of Sir Adam Beck, father of Ontario Hydro, Gordon Morton McGregor, founder of the Ford Motor Company of Canada, and Alexander Graham Bell, inventor of the telephone, illustrate how new technologies harnessed natural energy sources and created new ways to communicate. Such innovations drove the transformation of Canada in the early years of the twentieth century. An expanding nation required thousands of new people to answer the demands of the agricultural enterprises in the west, the manufacturing industries of central Canada, and the fishing and lumbering businesses of British Columbia and the Atlantic region. Many newcomers were drawn from eastern Europe and Asia as well as the British Isles and western Europe, traditionally the homelands of new Canadians. The Doukhobor leader Peter Vasil’evich Verigin, the housemaid Angelina Napolitano, the Chinese teacher and merchant Yip Sang, and the Orthodox clergyman Nestor Dmytriw all took their places in the increasingly complex ethnic mosaic. Social and economic changes inspired demands for other types of change. The movement of women into the professions is exemplified by the life of Clara Brett Martin, the first woman called to the bar in Canada. Jeanne Lajoie, an embattled Franco-Ontarian teacher, joins writers Sara Jeannette Duncan, Félicité Angers (known as Laure Conan), Joséphine Marchand (Dandurand) and Marjorie Lowry Christie Pickthall in the cast of women prominent in this volume. Among those representing arts and sports are the painter James Wilson Morrice and the brilliant goalkeeper Georges Vézina. Without question Volume XV of the DCB/DBC will take its place as one of the finest to appear in this distinguished ongoing series of Canadian lives. The Press regrets this error and will provide a corrected tipped-in page, at no expense, if you return the volume. Alternatively, if you contact me, I will send you an erratum slip or a label to correct the error. View More In Regional Canada. If you have any questions about this product by Brand: University of Toronto Press, Scholarly Publishing Division, contact us by completing and submitting the form below. If you are looking for a specif part number, please include it with your message.